Somehow those crack-of-dawn workouts held while the rest of Brandeis sleeps don’t seem quite so grueling. And the arduous afternoon practices at the Joseph M. Linsey Sports Center pool — they don’t hurt so much either. Varsity swimmers Holly Spicer ’13 and Niko Karkantis ’13 churn through as many laps, lift as many weights, and run as many miles as they did before Brandeis grounded its swimming and diving teams in 2010, but now they do it with a special sense of delight as the Judges wade back into the NCAA swimming world after two years ashore. When Spicer, Karkantis and three fellow freshmen finished the 2009-10 season, it was unclear whether they would ever swim for the Judges again. A year and a half earlier, the Linsey pool had finally succumbed to the infirmities of old age, leaving the team high and dry. Although two nearby schools, Bentley University and Regis College, allowed the Judges to use their facilities for two seasons, the commuting became problematic, and the program was suspended. More than a year later, the Brandeis Board of Trustees, at the urging of new President Fred Lawrence, approved a $3.5 million renovation of the pool and reinstated the swimming and diving program for the 2012-13 season. Thelma Linsey, Joseph’s widow, made a $1 million gift to support the center and its operations. Spicer remembers receiving an email on April 1, 2011, informing her the team would return to varsity competition in fall 2012. “I was thinking, If this is an April Fools’ Day joke, it’s not so funny,” she says. It was no joke, and the Judges began practice in late September in anticipation of their first dual meet in 33 months, against Wheaton College on Oct. 20. The teams include 15 swimmers who have never before competed for Brandeis. Also new is the man patrolling the pool deck: Mike Kotch took over as coach after Jim Zotz retired following more than three decades at the helm. Kotch is familiar with the challenges of a new program. He was a member of the first swim team at Bentley in fall 1994 and later served as coach at Regis for three years, including the second year of the men’s program. Even though Kotch’s seniors are essentially sophomores in terms of experience, he has entrusted them with the leadership of the program. He looks to them to ensure their younger teammates adjust to life at Brandeis — in and out of the pool. Although Spicer and Karkantis each competed for the Judges’ club team during the past two years, the experience was nothing like swimming at the NCAA varsity level. There were no coaches to guide them and no real sense of camaraderie. Without the structure, Karkantis felt lost. Now that they’re back in the pool, all the seniors feel a responsibility to continue the rituals passed down to them. For instance, the team still celebrates swimmers’ birthdays by making them fight their way through a 50-yard butterfly while teammates with kickboards roil the water. 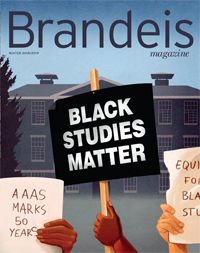 “It’s up to the seniors, as the leaders, to maintain the Brandeis traditions that we learned,” Spicer says. Just the kind of unsinkable commitment the Judges need to make a splash.